It's been nearly eight years since I published a novel for adults. This is not because I've been lying around on sofas, eating peeled grapes, but because things have got in the way of my writing. These are both personal (moving from Manchester to Cambridge after living in the former for 46 years, my husband's last illness and death and so forth) and professional. I haven't been idle. Children's books have appeared during this time, but since A Hidden Life, I haven't published a novel for adults. And that's mainly because this particular novel, Cover your Eyes, has given me more trouble in the writing than any other of my books. On the face of it, there's no obvious reason for this. I had the germ of the story right from the beginning, but in the first and second drafts and the subsequent fiddlings and fossickings that went on once the novel had actually been written, there were many different things to get right. The first was that I needed to create convincing voices and stories for each of my heroines. I like having more than one heroine in my books, and I enjoy going from one point of view to the other. Perhaps this is to stop myself from becoming tired of the single vision throughout, but it's also I think, (and hope!) a way of appealing to readers of different ages. The first thing you have to get right is the language. I made the decision early on to have Megan's sections in the first person, and that meant that the words had to be ones that were suitable for a young woman of 29. Eva's part of the story is in the third person, (a sort of modified form, which is really her point of view). Also, I enjoy writing about the past. I blog on a site called The History Girls, which is for writers of historical fiction, and I count myself as one of those. I like going back in time and to this end, I have always put a character who is about 75 or 80 years old in my novels to provide a view of the past. In my first adult novel, Facing the Light, (now only available as an e book from Quercus) the whole action of the novel takes place during the 75th birthday celebrations of my heroine, Leonora. Her memories of childhood, and of being young and middle-aged were layered into the narrative, and I wrote all seven of these 'past' bits first, before writing the rest of the book. I then slotted them into their appropriate positions at the end. 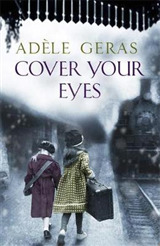 In Cover your Eyes, my elderly heroine is Eva, and she came to England in 1938 on the Kindertransport. She has a secret that she has revealed to no one, and she is haunted, quite literally, by a ghost about whom she has never said a word. She used to be a famous dress designer and she meets the other heroine of the novel, who's a journalist, when the latter (Megan), comes to interview her for a fashion magazine. Eva's narrative is intercut with memories of times from her past, in the manner that I used in Facing the Light, but in this novel, I wrote the sections in the past as I went along. Megan is recovering from being dumped by her married lover. Eva is sad because her beautiful home, Salix House, is going to be sold. Stuff happens, and Megan ends up living in Eva's house, where she becomes aware of a certain strangeness - she sees and hears things that she can't explain. I won't say more; I don't like spoiling the plot, but I hope that everyone who reads the book enjoys it. It went through several incarnations because it's very hard to weave a supernatural element into a typical 'women's fiction' story. I hope that there are things in this book which resonate with lovers of historical fiction* too. Even though only small sections of the actual story take place in the past, I like to think that what happened to Eva when she was four and came to England for the first time, tinges the book and gives it its flavour, rather like the Angostura in a drink of gin and bitters. * I have also written a children's book about the Kindertransport, called A Candle in the Dark, published by A&C Black, which is suitable for readers of seven and upwards. I find it immensely hard to imagine you lying on a sofa, eating peeled grapes, Adele! I really loved this book, Adele, and felt the "ghost" worked really well! One of those books you can't help going back to reading for a little while when you wake in the night - and then notice that morning's come already.